In our early days, Flutter FETTI was based out of New Orleans. So, we’ve seen our fair share of incredible parades - especially Mardi Gras, which features dozens of mind-blowing parades every year! Since then, we’ve been working on perfecting our parade confetti and streamers so that we can spread that same Laissez les bon temps roule energy all across the country to parades of all sizes and for all occasions! Even though we definitely have a soft spot for it, our parade decoration options aren’t just limited to Mardi Gras. With our help, it’s easy to make your Independence Day parade, Mardi Gras parade, Cancer Parades, St. Patrick’s Day parade, LGBT Pride Parade, or any other celebration magical. Our signature Flutter FETTI comes in a wide variety of includes many different types and colors and has been featured in hundreds of parades, including the Macy’s Thanksgiving Day Parade in New York City (did you know our Flutter FETTI parade decoration products are used to make it “snow” as Santa arrives?). Our Flutter FETTI parade confetti and streamers are biodegradable, simple to clean up, and hand-dipped in flame retardant bath so they won’t burn. There’s nothing quite like seeing the reaction on people’s faces the moment that parade confetti and streamers get blasted into the air! Flutter FETTI's must-have parade decoration products get the crowd’s attention so we know firsthand how to get people cheering and jumping! To make your parade confetti and streamers pop, you need to have the right launchers. Our stock includes several different fantastic types of launchers that will really take your parade to the next level. Parades across the country use items including airless hand-flick confetti launchers, a Master Blaster Launcher, and Continuous Flow Gerb Confetti Launchers (available for purchase or rent). These parade decorations are easy to use, affordable, and tons of fun. Many floats use our Continuous Flow Gerb Confetti Launchers to blow a continuous flow of parade confetti and streamers over the audience, and our Mardi Gras Swisher FETTI® featuring iconic Mardi Gras colors and pom-poms are a big hit with crowds! 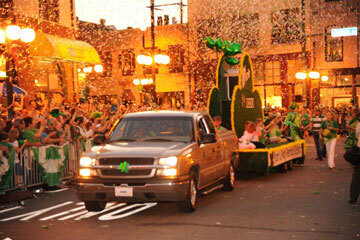 At Flutter FETTI, we’ve helped make countless parades, concerts, parties, and events truly unforgettable! We’re excited to collaborate with you and make the PERFECT product recommendations for your parade! 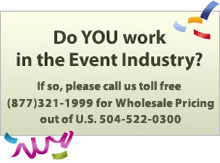 Contact one of our creative Confettiologists Toll Free and we’re available to answer any questions you have at (877) 321-1999 or through our Get A Quote Page. There we can learn about your event and recommend the right product to add the perfect effect to your event. Get your crowds cheering with parade confetti from Flutter FETTI!